This Rigid Industries grille kit is designed specifically for the 2007-2013 Toyota FJ Cruiser and allows for a clean, discrete install of Rigid Industries high output lighting. It includes replacements for both upper and lower grilles. 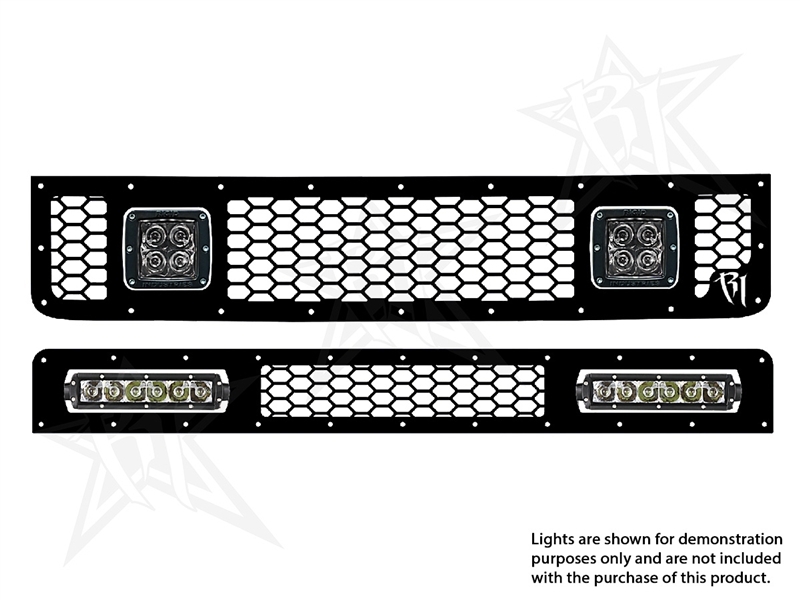 The upper grille accepts two (2) D-Series LED lights and the lower grille accepts two (2) SR-Series LED light bars (lights not included). These 2-piece grilles are made from laser-cut 304 stainless steel and are assembled using stainless steel button socket head bolts and nyloc nuts - no welds. They both feature a high quality black powder-coat finish and mount securely using OEM mounting locations. Installation requires modification to your OEM grille shell. We recommend professional installation.